I am excited to say that I will be on Fox 59 Morning show tomorrow at 9:15am to promote our event for Brides Against Breast Cancer. Make sure to watch or tape to see me talk about this great event. We are also going to feature three models wearing dresses you will be able to purchase this weekend. If you are a bride and want to see what might be there, this is a great way to see some dresses. Again, this event is going to be great and we cannot wait to help you find your perfect dress. It was a great segment, here is the link, enjoy! Ok, I was married awhile ago and even have two wonderful children, but I think I am like many of you and love wedding dress shopping. I was able to go with my sister-in-law recently dress shopping and had so much fun. 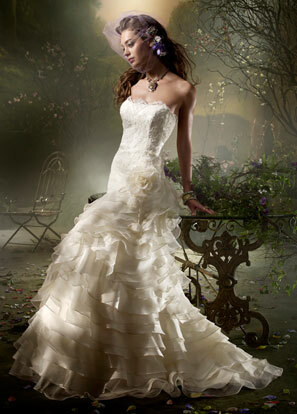 It got me thinking and I decided to have a little fun myself and window shop for wedding dresses. Now, I loved my dress at my wedding and I do not know that I would ever change it, but here are some dresses that I would need to try on if I was getting married now instead of before. I also should note that I am assuming that I am still the same pre-children dress size, if I tried any of these dresses on now I might cry :-)! The interesting thing about doing this is I have noticed that my style has changed. Some of the above dresses I never would have even tried on. This is an important lesson for you when trying on wedding dresses. Even though you may go into the dress shop with a set type of dress, do not be afraid to try something different, you might find that you like a different style. Dresses in pictures always look good because they are worn by models and shot in the best position. Not all dresses look good on all brides. You can be a size 2 but if you are shorter a ball gown will probably not work for you. My sister-in-law went into the store wanting a certain silhouette and ended up buying another. If we had not made her try the other silhouette (which she originally thought would not work for her body type), she may not have found that perfect dress. Since I am not getting married again, I ask that all of you have fun and try on these dresses for me. Let me know if they look as good on as they do in the pictures. I am excited to announce that I am the tour coordinator for Indianapolis to bring Brides Against Breast Cancer Tour of Gowns back to Indy! Brides Against Breast Cancer is the main fundraiser for the Making Memories Breast Cancer Foundation. This is a charity wedding gown sale that allows brides to purchase new and used wedding dresses for a great price and all the proceeds go to granting wishes for stage IV breast cancer patients. We are still working out the details, but I will keep you updated as new information becomes available. If you would like to attend or even volunteer, please visit their website. This will be an exciting event that you do not want to miss!